Maybe you’ve been led to believe that the only way to change your nutrition habits is by eliminating foods, or entire food groups from your diet. What if the real key, though, was adding “good” things to your diet rather than subtracting all the “bad” things? Look, I get it. You probably prefer, like all of us, to get results like, yesterday. But, thinking like this can lead to elimination diets. Oftentimes these are cut all at the same time! What are you going to eat now that you’ve cut 14 food groups? Will you be happy enough to sustain this? If you are going to do an elimination diet, what is your plan to reintroduce the foods you took out? Weight loss is hard and I’d be lying if I said it wasn’t. Eating “healthy” can be a chore too, well, because cheeseburgers. What can I add to my day that will help me reach my goals? Put the pitchforks down for a second and hear me out. By adding things to your daily diet and making them a priority, other less important things, like the glutens, will start to filter themselves out. Drinking a glass of water before each meal. This is great because a lot of us struggle to drink enough water daily, and it will help you get full faster. Make sure every meal has one (or two) servings of lean protein. Add one serving of veggies to each meal. Drink a protein shake before 1-2 meals each day. It works in the same way the glass of water trick does but also helps with hitting your daily protein goal. Increase the amount of time you spend chewing your food. Digestion starts in the mouth, and, the longer we talk to eat the more time we give our bodies to let us know that it’s full. You’ll notice leaving meals satisfied, but not miserably full. Add higher volume foods or liquids to each meal. This could mean going to diet soda, using water rather than milk in your protein shake or ricing cauliflower as a substitute for regular rice. 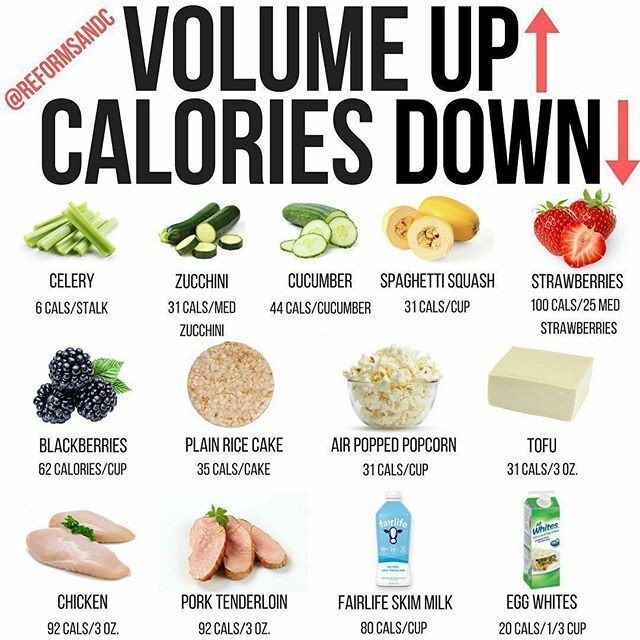 I’ll toss in a graphic of high volume foods below. Don’t get it twisted, you’ll still be hungry. It will still be a chore until you’re used to it. The addition route will technically take “longer”, too. But, like we talked about, the subtraction route is rarely sustainable. 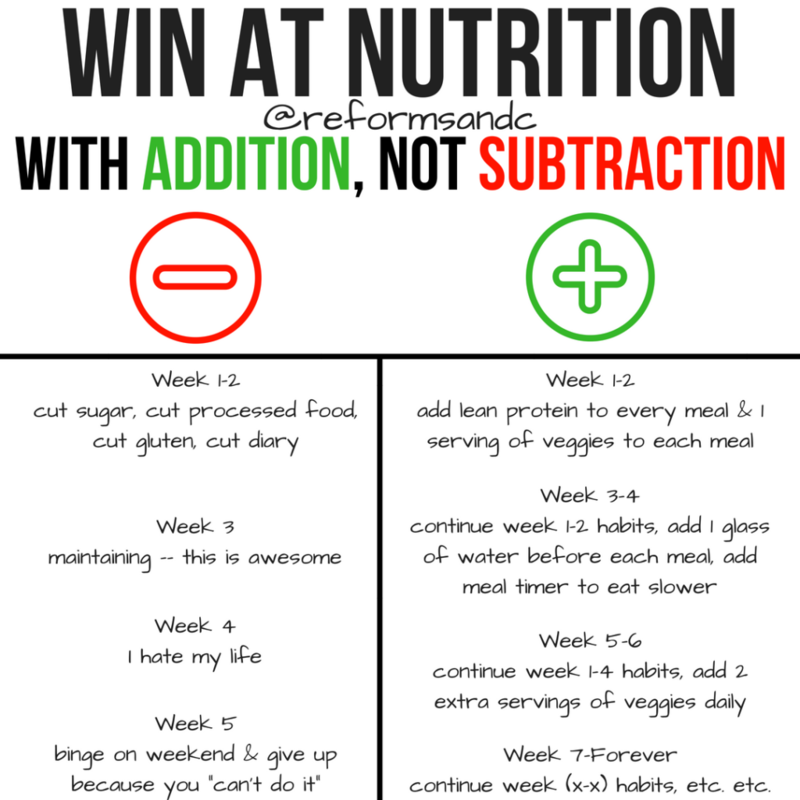 The addition method and building habits can and will help you stay in the game for life.